Father Brennan Burke's patience is tested to the limit when a young woman announces to the world that the Virgin Mary has appeared to her in his churchyard, and hordes of pilgrims, souvenir hawkers, and reporters converge on the scene. But, as unwelcome as these guests may be, they pale in comparison to yet another aggravation in Father Burke's life, a controversial talk show host who clashes with Burke the minute he arrives in town. Events take a darker turn when a body is found at the apparition site, and the talk show host is picked up for the murder. There is enough aggravation to go around, as Monty Collins learns when he takes on the loud-mouthed TV man as a client. Monty and Brennan both have a stake in uncovering the truth about the murder, and they both learn disturbing things about the accused man and other suspects in the case. Problem is, Monty and Brennan cannot talk to each other about what they find out, because one is bound by solicitor-client confidentiality and the other by the seal of the confessional.And Monty has other things to deal with as well, when an emergency forces him to make some crucial decisions in his personal life. Another sharply plotted entry in the Collins-Burke series, which is distinguished by its well-drawn characters and unique setting. The author, who hails from Halifax, does an excellent job of anchoring the story in the city. … Keep ’em coming. Following Monty and Father Burke through the back streets, blues clubs and waterfront district of 1992 Halifax in search of the truth is an enjoyable quest . 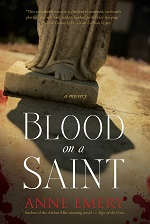 . . Emery skillfully blends homicide with wit, music, theology, quirky characters and a Nova Scotian atmosphere. What elevates Emery’s latest from a superior exercise in suspense into something larger is the way she explores what people disclose and what they don’t. Father Burke receives vital information through the confessional, but cannot tell the court because of his religious oath. Collins, in turn, is bound by attorney-client privilege. And Podgis, for all of his ornery bluster, proves to be the biggest cipher of all. Emery not only bridges these non-disclosures together, she does so in a wholly plausible manner that deepens that unlikely friendship of two complicated men that much further. "One of ten crime novels to read this holiday season. The seventh in the series is one of the best yet." Halifax lawyer and award-winning author Emery uses strong characters and dialogue to deftly touch upon the paradoxes between superstition and belief, between reason and faith, and between justice and forgiveness.